Boiler Emissions/Efficiency Monitor replaces large CEMS systems. Retrofit to any boiler system, stand-alone DataStak™ packaged emissions and efficiency monitoring system that works independently from existing boiler controls and offers alternative toÂ intricate CEMS systems. It utilizesÂ 2 separate panels –Â Allen-Bradley CompactLogix PLC with touchscreen operation, and electrochemical analyzer system – and offers O2, NOx, CO, and CO2 measurements in addition to real-time boiler efficiency, fuel usage, and carbon footprint calculation. Fremont, CA – Nationwide Boiler Inc., known for innovation in the industry, has announced their latest product to market: the DataStak™. The DataStak™ is a cost effective, packaged emissions and efficiency monitoring system with O2, NOx, CO and CO2 measurements, in addition to real time boiler efficiency, fuel usage, and carbon footprint calculation. It is an alternative for large, intricate CEMS systems offering similar functionality and abilities at a fraction of the cost. The system utilizes two separate panels; an Allen-Bradley CompactLogix PLC with touch screen operation and a high quality electrochemical analyzer system, and works independently from existing boiler controls. It is a stand-alone product and can be retrofitted to any boiler system. The DataStak™ has been engineered to fulfill monitoring requirements in certain air districts in California, including the San Joaquin Air Pollution Control District (SJVAPCD) and the South Coast Air Quality Management District (SCAQMD). Specifically, the system will meet most of the SSP-1105 Emissions Monitoring for Rules 4305, 4306 for the SJVAPCD and ASTM D6522-00 standard for the SCAQMD. The operator interface panel is built to NEMA 4 and UL508 standards, and the emissions monitoring equipment is built to ISO standards. “In today’s marketplace, energy and facility engineers need to have real time NOx and CO calculations at their fingertips, and they need to also know the efficiency, fuel usage, and the calculated carbon footprint of their boilers. They need data that is easily available for AQMD reporting purposes. The DataStak™ is more than just a combustion or NOx analyzer The fact that it provides the carbon footprint, boiler efficiency, and CO2 data separates the system from what is currently on the market. We developed this product with the end user in mind and a goal of making their job easier,” stated Larry Day, President of Nationwide Boiler. Nationwide Boiler debuted the DataStak™ at the California League of Food Processor’s Expo in Sacramento, CA in February. The company will provide its first unit to a new manufacturing facility located in Newark, CA for a 475 hp firetube boiler. Contact Nationwide Boiler at 1-800-227-1966 for more details. 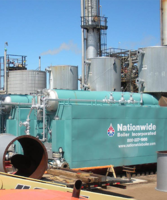 For nearly fifty years Nationwide Boiler has provided superior solutions to meet the temporary and permanent boiler system needs of every industry. Today, Nationwide Boiler continues to provide innovative products and leads the nation with the most successful 5 ppm NOx retrofit/installations for packaged boilers with the exclusive CataStak™ SCR system. Nationwide Boiler is committed to providing customers with 24-hour responsive, technical support and high quality solutions. Visit their website at www.nationwideboiler.com. Saturated Steam Mobile Boiler features 125,000 lb/hr rating. 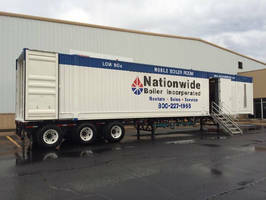 Low NOX Mobile Boiler Room targets rental market. Air Quality Monitor helps increase health care facility safety.